I spend quite a bit of time sitting at my computer, and after a while my wrists really bothers me, which is a problem when you blog or play games or anything like that. I found the answer for that. 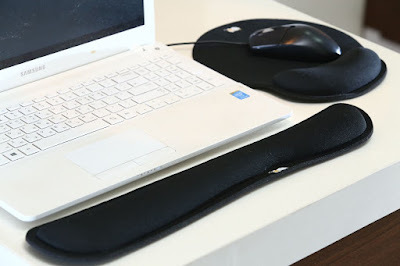 The Keyboard Wrist Pad + Mouse Pad by Cushion Care. It's made from durable high quality foam, perfect for long hours of computer work. It's ergonomically designed, helps maintain proper wrist alignment, preventing wrist injuries or problems. (rheumatoid arthritis, and carpal tunnel syndrome) The foam conforms to your wrist for real comfort. The Keyboard Wrist Pad +Mouse Pad have a non slip backing that holds them in place while in use. I'm using mine now, and typing has never been this comfortable! Plus it's risk free. There's a 3 year warranty with this product. I highly recommend it.